Referendum co-ordinator Vicente Bello said the number of signatures had "clearly exceeded the minimum needed". 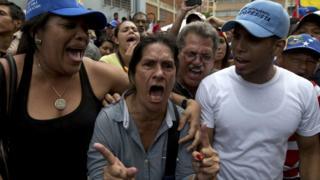 The opposition blames Mr Maduro's socialist policies for rampant inflation and shortages of food and basic goods. "Prices are going up every day, on top of the shortages," said civil servant Felix Rodriguez, who skipped work to give his signature. But if the vote were to be held after 10 January - in the last two years of Mr Maduro's mandate - he would be replaced by his vice-president and supporter, Aristobulo Isturiz.